Definition at line 499 of file address.h. Construct an empty invalid UDP address. Construct an UDP address from a string. Construct an UDP address from another UDP address. Construct an UDP address from a GenAddress. Construct an UDP address from a IP address. The port will be set to 0. 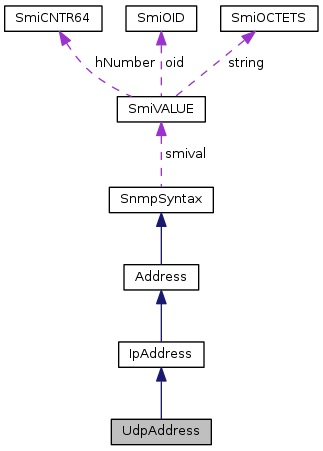 Destructor (ensure that SnmpSyntax::~SnmpSyntax() is overridden). Definition at line 546 of file address.h. Definition at line 643 of file address.h. Definition at line 587 of file address.h. Definition at line 580 of file address.h. Get the length of the binary address (accessible through operator). Definition at line 622 of file address.h. References UDPIP6LEN_NO_SCOPE, UDPIP6LEN_WITH_SCOPE, and UDPIPLEN. The port number, or 0 is the object is not valid. Get a printable ASCII value of the address. Definition at line 594 of file address.h. Definition at line 575 of file address.h. Return the type of the address. Definition at line 631 of file address.h. Map a IPv4 UDP address to a IPv6 UDP address. - TRUE if no error occured. Overloaded operator for streaming output. Definition at line 602 of file address.h. Map other SnmpSyntax objects to UdpAddress. Map other Address objects to UdpAddress. Overloaded assignment operator for UdpAddress. Overloaded assignment operator for IpAddress. If the object is not valid(), the port may not be set. Definition at line 652 of file address.h. Definition at line 653 of file address.h.